Darlene, my oldest BFF in terms of our years together, will be the first to tell you I am prone to the church giggles. She would know. She attended church with me from the time we were five and six. We attended grade school and high school together, so she will also tell you that I have a penchant for the library giggles. Next on this hierarchy are my giggle attacks whenever I’m tasked with being reverential and silent. This is an unnatural state for yours truly. For example, there was this yoga class. Marovich, my other BFF since 7th grade, went with me to be supportive of our mutual BFF, whom I’ll reference as “Anonymous” for reasons you will see in a moment. Anonymous was in breast cancer recovery, so we gladly did anything she asked of us. But yoga is not my thing. There’s WAY too much silence. Like picking folks up from Midway Airport–Midway’s call letters should be changed to BFE, IMHO–you know I really love you if I agree to attend a yoga class with you. So there we all were…laying flat on our backs in this yoga class. Marovich was laying to my left. Across from the tops of our heads, Anonymous and her daughter were also laying there. About halfway through the class, the instructor asked us to grab our knees and squeeze them to our chests. We were doing as we were told when Anonymous grabbed her knees to her chest, ripping the loudest-ever yoga class fart, “like a bullet being shot from a pistol,” as Marovich would later recount. Just sitting here writing this, I’m giggling all over again. We tried collecting ourselves–Marovich and I–but it was GAME OVER. Anonymous and her daughter were also dying, which helped not even a little. Tears of laughter were rolling down my temples as I laid there shaking and hugging my knees to my chest. Every time I’d finally stop giggling, Marovich would start up again. And vice versa. It was an endless cycle of re-giggling. Then the instructor scolded us, which only made us giggle even harder. It was HORRIBLE. I’m sharing this back story to help you understand how truly vulnerable I am. So along comes Mother’s Day. Jack, my mom and I all went to church together. (Dave stayed home to paint his new cover for comic book creator Timothy Lim.) My mom sat between Jack and me. I think this was strategic on her part. She knows the two of us sitting right next to each other can be…shall we say…combustible? As an added bonus, and completely unplanned, one of my newer and hilariously funny BFFs was sitting in the pew directly in front of me. Eventually, after much singing — we are Lutheran after all, so if there’s a sixth verse to a hymn, it will get sung — we progressed to the prayer portion of this Mother’s Day 2018 service. The visiting pastor was reading aloud all of the people’s names on the list that the parishioners had submitted to be lifted up in prayer. All was going well, when suddenly he announced that we should pray for Jim McNugget. Jack whiplashed his head to the right, looking at me, while I whiplashed mine to the left, locking eyes with him. Instantaneously, we were both doubled over, silently laughing. This was church, after all. I somehow managed to reign in the 10-decibel version of my laugh. 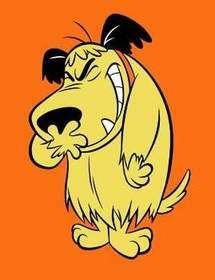 Instead, I exuded more of this Muttley-style laugh, half silent, half sounding like a COPD patient with a gurgling, pleurisy-riddled lung. There may have been a snort at some point. Our entire pew was shaking from our laughter. This was no easy task, given its robust, solid wood construction. Mom sat between us, stoic, completely oblivious to our shenanigans. Then I looked up and saw my BFF’s shoulders shaking in front of me. That made me giggle even harder. She relayed to me later that she heard me laughing and managed to hold it together, but then she spied from the corner of her left eye Jack all doubled over, mouth open in silent laughter, all red-faced. The visual was her breaking point. Thank God for small miracles that she couldn’t see me! After church, my BFF and I analyzed the situation. Was there really someone in this world named Jim McNugget? Or was the pastor just hungry? Since our church service ends around noon, this wasn’t beyond the realm of possibility. Could this have been his fast food Freudian slip? Well, today we got our answer. The same person from last week was on the prayer request list for today. This week, he had a last name similar to McNugget. But it was not McNugget. And this did get me forming a future shenanigan. I do so enjoy seeing my BFF’s giggle-shaking shoulders in church. I may have to submit someone to the prayer list who wishes to remain anonymous. And that someone may get assigned a pseudonym for their last name…like Doodlesack. Or McCheese.